Ducky and Turtle Regatta Fundraiser – And The Winners Are……. !! EVTA and the Yadkin Valley Rotary Club will be holding a Ducky Derby and Turtle Regatta on the Elkin Creek on September 22 at 5pm during the Pumpkin Festival in Elkin. 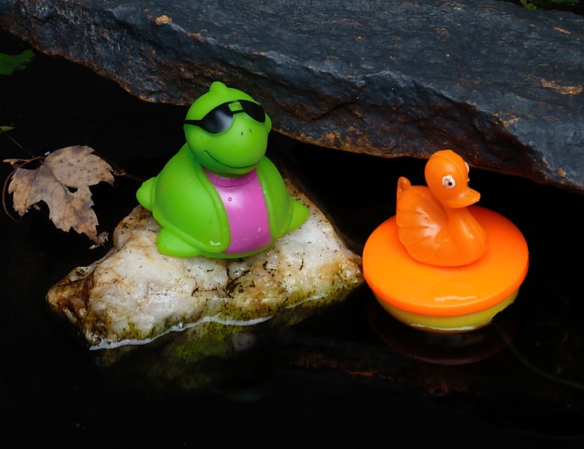 To enter you must purchase a turtle or ducky for $5 each from selected Elkin business establishments or Rotary members. Turtles and Duckies will also be sold at the Pumpkin Festival in Downtown Elkin. There will be loads of prizes and all proceeds will go to EVTA and to the Yadkin Valley Rotary Club for great causes right here in Elkin. No need to be present to win. (But your assigned turtle or ducky has to swim fast)! The race on the Elkin Creek will begin at the Shoe Factory Dam and the finish line will be under the Rt 268 bridge at the north end of Elkin’s Municipal Park. Come cheer on your turtle or ducky on the future E&A Rail Trail along the Creek! All PayPal donations from the EVTA website from August 22 til September 22 go to the Turtle and Ducky Regatta fundraiser race and will be shared with Yadkin Valley Rotary Club to benefit community projects. Paypal donations after September 22 are for EVTA. ← EVTA Recieves $25,000 Grant from Lowe’s for Bridges! Home » Ducky and Turtle Regatta Fundraiser – And The Winners Are……. ! !